Here’s a couple of websites to bring to your attention, each dedicated in one way or another to the Triangle Film Corporation. Triangle was formed in 1915 following a parting of the ways between the brothers Harry and Roy Aitken and other board members at the Mutual Film Corporation. Harry Aitken formed the Triangle Film Corporation in July 1915 with the plan of releasing the films of three prominent producers: D.W. Griffith, Thomas Ince and Mack Sennett. For three years it was a considerable force in American film production before it was dissolved, brought down in part by the huge costs of Intolerance – ironically enough, given that it was formed on a tide of optimism and finance that followed the great success of The Birth of a Nation. The first site is The Harry & Roy Aitken Collection, created by the Wisconsin Center for Film & Theater Research, Madison. The WCFTR holds the papers of the Aitken brothers, comprising scripts, photos, promotional materials, company ledgers, legal records, and both personal and business correspondence. 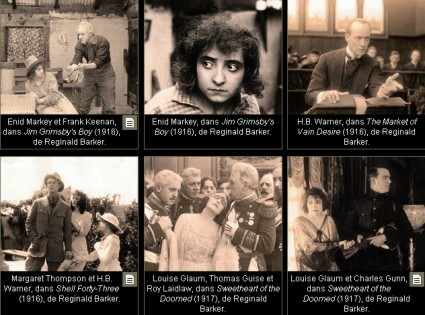 The site exhibits documents from one part of the collection, the Scripts and Scenarios series, using selected digitised documents to illustrate the great changes that took place in American film practice in the 1910s. The site comprises a timeline of developments in cinema in the 1910s; and a summary history of such developments, focussing on such key aspects as the arrival of feature films, the formation of exchanges, the distribution of features, and their exhibition. The central section is Continuity Script and the Rationalization of Film Production, which illustrates its historical thesis with digitised documents showing examples of Proof of Copyright, Detailed Scenario, Credits and Condensed Story, Locations, List of titles, Continuity Script Excerpt, Complete Picture Report and Budget Summary, all of them for Triangle releases. Another section, Changes in Film Style in the 1910s, demonstrates changes in lighting, staging, performance, editing and cinematography films at the start and end of the decade, with clips and stills as illustration. Finally there’s a case study based on The Clodhopper (1917), directed by Victor Scherzinger for Kay-Bee and released by Triangle, with a clip from the film and its matching continuity script. Secondly, there’s the recently-launched La Triangle (1915-1919): Archives, recherche et histoire du cinéma, created by the Cinémathèque française. This brings together film clips (William S. Hart in The Desert Man, 1916 and Thomas Ince’s The Despoiler, 1915) with analyses of their restoration, photographs, digitised archival documents (including another contintuity script, for Lieutenant Danny, 1916, essays, catalogue records for relevant papers in Paris, Madison and Chicago, filmography, bibliography and weblinks. Even if you don’t read French, the gallery of photographs alone is gorgeous to look at, and both sites are properly scholarly and just a little bit enthusiastic about their their subject, which is not just Triangle but the extraordinary way in which American film production stylistically and structurally evolved, matured and conquered the world over the period of the 1910s. My thanks to Andrew Comiskey for alerting me to both sites. Here’s a good research resource which I hadn’t come across before (and should have). New York State Archives has the largest collection of film scripts in the world, some 53,000. It makes available a database of its script index, covering the period 1921-1965 (it advertises itself as covering 1927-1965, but I’ve found records going back to 1921). This doesn’t give you the script itself, just the bare outlines of the production details, but these are more than valuable enough in themselves. Each record gives you (and is searchable by) original title (there are many non-American films listed), title in English, country, year, writer’s last name, director’s last name, alternate film title, manufacturer, and exchange. The Motion Picture Commission began its work in 1921, but tragically almost all of the 18,000 scripts for silent films that passed through its hands are now lost. However, the outline records are still there, and form a hugely useful reference source by themselves, and for a lot of these titles the archives have associated documentation, but not the script itself. The collection exists because, for forty-four years, New York state censorship required distributors to submit scripts for vetting, so anything exhibited theatrically in New York between 1921 and 1965 is going to be there. The archive also contains the apparatus of state film censorship – applications for licences, reviewers’ reports, notices of change in title or length etc., as well as the scripts. 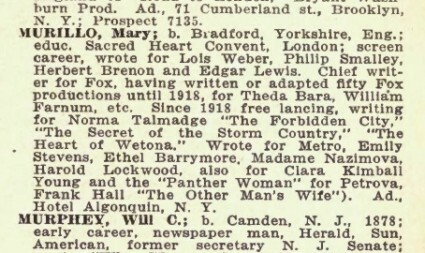 Scripts only start to be available from 1927. Frustratingly, there doesn’t seem to be any way to search on extant scripts for silent films. Nor can you combine search requests, so you can’t automatically look for all Walt Disney-produced films in 1924, for example. Minor gripes apart, this is a major gateway into the films of the 1920s. It’s possible to order copies of scripts, if you are the copyright owner, or have the permission of the copyright owner, or can claim copies under a ‘fair use’ declaration. It may also be that you have to be a United States citizen – it’s unclear. There’s growing interest in the study of silent film screenplays, particularly at the moment in Britain where so few silent film screenplays have survived, which only adds to the challenge. Charles Barr’s work on Eliot Stannard, Hitchcock’s scenarist in the silent era, has been followed by the ongoing research of Ian McDonald at University of Leeds, who is conducting a survey of extant British silent film scripts. All of which preamble introduces the latest addition to the Bioscope Library, J. Berg Esenwein and Arthur Leeds’ Writing the Photoplay, first published 1913 and then in a revised version in 1919. It is the latter that is available from Project Gutenberg. It is a standard ‘how to’ guide, published by the Home Corresspondence School of Springfield, Mass. (odd how Springfields keep turning up these days), so presumably it ended up being read by those more optimistic than talented. Nevertheless, it says all the right things (“Action is the most important word in the vocabulary of the photoplaywright”), and it goes into great detail about the process of producing a screenplay, covering its component parts, how a script should look, the mechanical production of a film script, devising a scenario, delineating characters, the use and misuse of titles, and how to market a screenplay. There is an example of a completed screenplay, Everybody’s Girl (adapted from an O. Henry story and released by Vitagraph in 1918). 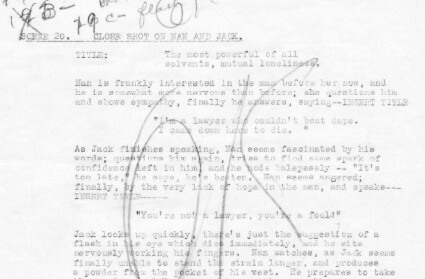 There is also some amusing advice on what not to try and include in your screenplay (expensive scenes like the sinking of ships, ‘trick animals’, special costumes), and advice on what not to include in your screenplay owing to the attentions of the censor (“Write as your conscience and a sense of decency as an individual and as a good citizen dictate”). It’s all sensible stuff, with interesting insights throughout and plenty of incidental comments on the routine of film production that is useful to the researcher now. There are some good photographs on studio production, and Gutenberg have most helpfully provided hyperlinks not only for chapters and illustrations, but for the index at the back. E-books just get better and better. It’s available from Project Gutenberg in HTML (747KB) and plain TXT (624KB). I’ve found more information on Gwladys, Marchioness of Townshend, who wrote some scenarios for the Clarendon Film Company, and an interview with whom was given in an earlier post. The new source of information is her autobiography, It Was – and It Wasn’t, written in 1937. This tells us a little more about the agreement she made in 1912 with Clarendon to produce scenarios for them, and gives us more film titles than I had listed. 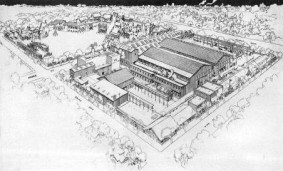 I had been keenly interested in the Cinema Theatre and its possibilities at Maidenhead, and in 1912 I entered into an arrangement with the Clarendon Film Company of Charing Cross Road, to produce a series of picture plays; the first play, A Strong Man’s Love, being well received by the public and the Press. The House of Mystery followed. These were the first cinematograph dramas to give the author’s name, and I was the first peeress to write for the Cinema. Were these the first films to credit the scenarist (as opposed to a playwright)? I don’t know. 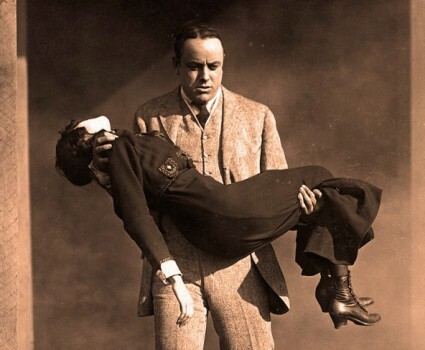 It might be Anita Loos, whose first film for D.W. Griffith was The New York Hat (1912), or Harriet Quimby, wrote wrote five scenarios for Griffith in 1911, but was either credited on screen? But I think Gwladys is on solid ground when she says she was the first peeress who wrote for the screen. Fascinatingly, she names two others who wrote scenarios after her – the Countess of Warwick and the Countess of Roden. I know nothing of either. The late Sir George Alexander and I believed in the artistic future of the Cinema. At that time I considered its moral and ethical possibilities limitless, and it is interesting to compare the views of the Gaumont Company in 1913 as to the prices paid for scenarios, with the money of 1935. In 1913 a representative of the Gaumont Company told an interviewer that, “on the whole, the scale of payment is not high, and the picture dramatist does not expect – at any rate, he does not receive – anything like the renumeration of his brother, the real dramatist. The royalty system exists, but it is not general, the plot usually being bought outright. The average price is that of a short magazine story, but many ideas are disposed of for half a guinea apiece.” At that time I was paid £300 for writing six film plays, but, fortunately for authors, prices have increased considerably since then. After my first film play was produced by the Clarendon Film company, the same company produced another – When East meets West. This completed a series of seven film dramas commissioned by the same company during a period of two years – A Strong Man’s Love, At the Convent Gate, The House of Mystery, Wreck and Ruin, The Love of an Actress and The Family Solicitor. All these sound most melodramatic now, but had their little success in those days. Crime. Vicar’s daughter elopes with actor who kills manager and is acquitted by barrister who loves her. Crime. Fake ghost, gas chamber, and raid on den of 50 coiners by 100 policemen. Drama. Jilted bride recovers sanity after being saved from fire. Drama. Film actress feigns drunkenness to repel peer but saves him from suicide after he takes to drink. Drama. Foreman saves mill owner from flood caused by striking workmen. Crime. Lawyer forges earl’s will so that his indebted son may inherit. Crime. Indian fakir hypnotises officer’s daughter and explodes gas bulbs from afar with electric rays. None of these films is known to survive today. Returning to the theme of British women filmmakers in the silent era, meet Gwladys, Marchioness of Townshend. 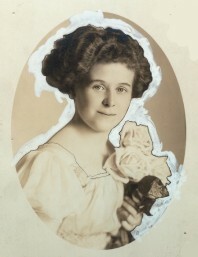 The humble British film industry was more than a little flattered when the Marchioness Townshend (1884-1959), born Gwladys Ethel Gwendolen Eugénie Sutherst, later Mrs Bernard Le Strange, agreed to provide scenarios for the Clarendon Film Company. 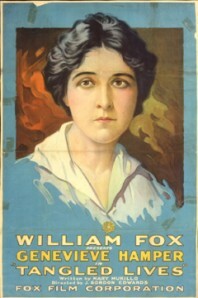 The films for which she supplied stories were Behind the Scenes, The Convent Gate, The House of Mystery and A Strong Man’s Love, all made in 1913. Sadly, none survives. The Marchioness of Townshend was a playwright, novelist and poet, as well as a celebrated socialite. 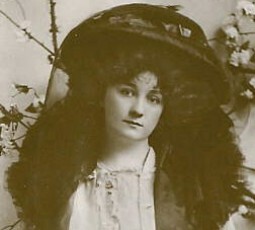 Her plays included The Story of an Actress (1914) and The Fold (1920), and her novels Married Life: The Adventures of Herbert and Mariana (1914) and The Widening Circle (1920). 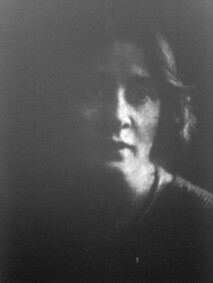 She wrote an autobiography, It Was – and it Wasn’t (1937) and a collection, True Ghost Stories (1936), which was still in print in the 1990s. We can only speculate about the films with which she was involved, but her opinions are interesting. 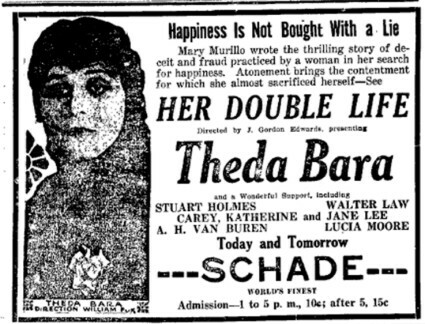 This interview with her, from The Bioscope in July 1914, hints at someone who had possibly turned to the lowly cinema through frustration at not getting her plays produced on the stage, but she was alert to the potential of the medium, and claims to have been inspired by early films of waves breaking on a sea coast, no less. Whatever her actual abilities, it was unusual at this time for a film scenarist to be given any credit at all, and it indicates a new significance which was being given to the craft. In view of the great interest aroused by the announcement of three new dramas by the Marchioness Townshend, to be shown to the Trade next Friday, we begged her ladyship to favour our readers with a few of her ideas on the subject of writing for the film, and were kindly granted an interview at the offices of the Clarendon Film Company, where Lord and Lady Townshend had called to inspect the recently completed films. Lady Townshend’s views are of partiular interest, not only on account of the great success achieved by “The Convent Gate,” “The House of Mystery,” and “A Strong Man’s Love,” but by reason of the cordial reception given to the one act play now running at the Coliseum. In answer to our question as to what first turned her thoughts to writing for the cinematograph, Lady Townshend said she had been deeply interested in moving pictures ever since her childhood, when she first saw a picture at the Palace Theatre of waves breaking on the sea-shore. It is gratifying to learn that the company engaged to play in these new dramas has the advantage of Lady Townshend’s personal supervision and advice. The Bioscope, 30 July 1914, pp. 430-431. 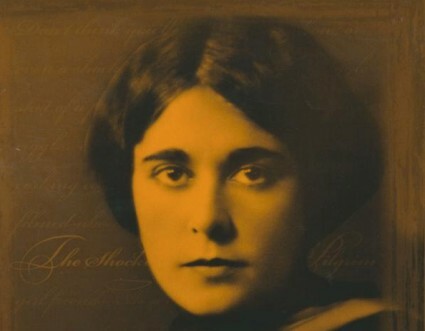 Nothing seems to have come of the six new ‘plays’ she was to have written for Clarendon, and so far as is known she had nothing further to do with the film business.